Dehydration occurs in the body when it loses more fluids than are put in. Elderly people are one of the highest risk groups for dehydration. Dehydration is a dangerous health condition for any age, but it is particularly problematic in the elderly. Studies of seniors admitted to hospitals found 6.7% were diagnosed with dehydration. By itself, this may not seem too concerning, but additional studies found death occurred in about half of elderly patients who were dehydrated. That’s frightening. Total body water decreases with age, putting seniors at a greater risk of developing dehydration because it doesn’t take much for them to go from being hydrated to being dehydrated. Elderly people also face a number of challenges staying hydrated because things like prescription medications, chronic diseases, muscular and neurologic conditions, and mental illnesses can interfere. Family caregivers that aren’t aware of the ease in which elderly loved ones can become dehydrated may miss all the signs and symptoms of it. Even seniors themselves may not be familiar with dehydration and believe since they are not thirsty, they can’t be dehydrated. Proper hydration is important for your loved one’s health. Water helps your loved one’s body to function just the way it should by flushing away toxins and keeping their cells and joints lubricated. Family caregivers definitely need to become familiar with all the common signs of dehydration in the elderly. 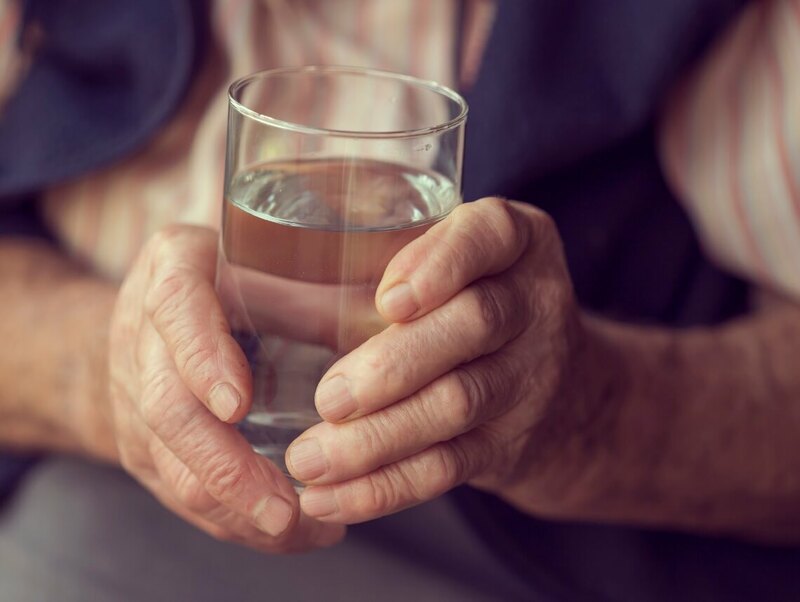 The symptoms and warning signs of dehydration in seniors can be a lot more subtle than in younger adults, so it helps to be alert and watchful when caring for an aging loved one. Complain of thirst: If your loved one says they’re really thirsty, that’s one of the first signs of dehydration. Dry lips or mouth: If your loved one’s lips look dry and they complain about their mouth feeling dry, they need to drink. Changes in mood: When seniors become dehydrated, it can affect their mood and they can become more irritated or withdrawn than usual. It can also cause elderly people to become more tired than usual and they don’t bounce back after resting. Bathroom issues: Seniors that are dehydrated may be constipated and not use the bathroom as often as they once did. Urine will be a darker yellow instead of light, showing the body is not getting enough water. Less elastic skin: Elasticity in the skin is a good indicator of whether or not someone is dehydrated. When the skin on the back of the hand is pulled, it should spring back within a second. If the skin stays puckered and wrinkled, then dehydration is in effect. Dizziness and headaches: When an elderly person’s body is desperate for fluids, they can experience headaches and dizziness. This is especially dangerous because the senior is then at a higher risk for slip and fall accidents. Disorientation: Is your loved one feeling dizzy or unsteady on their feet? It’s common for people in later stages of dehydration to experience confusion and disorientation. It can be especially hard to distinguish disorientation caused by dehydration if the elderly person is in the early stages of dementia. Losing weight: When seniors are dehydrated, they can lose up to a couple of pounds. While it’s not unusual for weight to fluctuate, it is just one more symptom of dehydration that may help caregivers figure out what’s happening. Low blood pressure: When dehydration is significant, it’s common for seniors to have low blood pressure as a result. While family caregivers may not be able to assess blood pressure in their elderly loved ones, they can inquire during routine health care checkups and take note of the results. Chronic dehydration can lead to long-term illnesses and significant medical issues, such as kidney stones, severe constipation, stroke/aneurysm, and infection. Your loved one might notice they’re thirsty, but more often than not, they won’t. If your loved one becomes more dehydrated, they’re likely to experience a worsening of the symptoms that occur during mild dehydration. Moderate dehydration can quickly become severe, so if you even suspect your loved one is dehydrated, it’s important to seek medical help right away. There are several steps family caregivers can take to treat their elderly loved one’s dehydrated condition. In the short term for mild dehydration, seniors can have water or sports drinks to quickly bring their body fluids up. They should also be encouraged to drink throughout the day, even if they don’t feel thirsty. Seniors can also enjoy fruit, smoothies, milk and more to help keep them hydrated. If your loved one is more than mildly dehydrated, though, they’re going to need much more help. Contact their doctor right away or take your loved one to the hospital so they can be treated properly. The good news is dehydration in seniors is completely preventable. The best way to help your elder loved one to deal with dehydration is to do what you can to avoid it. Helping your loved one to get the right amount of water may feel complicated, but it can be easier than you think. Bring everyone together. Make sure family members, home care assistants, and even the elderly person themselves are all aware of the goal for good hydration. Learning about the negative effects of dehydration in seniors should be enough to motivate everyone to stick to the plans and form good hydration habits. Always have water available. When seniors have water available, they can sip it throughout the day, which is often easier than drinking a large amount in one sitting. Many elderly people find it convenient to have a water bottle within arm’s reach throughout the day. Encourage frequent drinks. Seniors should be reminded to drink water throughout the day, even if they are not thirsty. An aging body may not feel thirst until it is more acute, so drinking regularly despite not feeling thirsty is a fine way to stay hydrated. Family caregivers, home care assistants, and family members can help seniors remember throughout the day. Slow and steady. Your loved one doesn’t need to drink all of their water for the day first thing in the morning and it’s not a good idea to drink it all right before bed, either. The better plan is to sip on water throughout the day so they have a constant influx of water. Again, using a water bottle can help your loved one to pace themselves so they’re drinking water at the right rate. Drink a full glass of water with medications. Any time your loved one is taking medications, especially if there are quite a few of them, it’s a good idea for them to take them with a full 8-ounce glass of water. This helps to make sure none of the medications stick in their throat and they have water in their system to process the medications. Check urine color. Ask seniors to check the color of their urine when they use the bathroom. If it is light yellow, they are getting adequate fluids. If the urine is darker or they are going less frequently, it’s time to boost the liquid intake. Minimal alcohol and caffeine. Because drinks like coffee, caffeine soda and alcohol are diuretics, they encourage urination and therefore deplete the body of valuable fluids. Seniors that want to stay hydrated should avoid drinks like this or at least drink them in moderation accompanied by plenty of water. Increase fluids when sick. With diarrhea, vomiting, excessive sweating and for general illnesses, the body loses fluids much more rapidly than when it is well. If an aging loved one is ill, even with a common cold, they need to increase their water intake. Sports drinks with electrolytes are especially good for seniors when they are sick. Exercise and water. If your loved one is exercising regularly, they may need to up their water intake. Drinking plenty of fluids such as water and herbal tea can be helpful. Talk with their doctor to see what your loved one’s water intake should be and how much to increase it during exercise. Work with your loved one’s home care providers to try tracking their water intake. Using a water bottle can help with this because it’s a visual reminder of how much water your loved one has had and how much more they should drink. What happens if your parent does not enjoy drinking water and resists drinking it because of this? Getting creative can help you to get around this challenge and encourage your parent to still get the hydration they need consistently. If your loved one isn’t excited about the taste of water, there are other ways to help ensure they get enough hydration. Eat juicy fruits and vegetables. Fruits and vegetables high in water content, such as watermelon, pineapple, grapes, celery, strawberries, plums, berries, cucumbers, and oranges or other citrus fruits are excellent sources of hydration. Smoothies and slushies are great to provide nutrition and fluids to elderly people as well. Other options include vegetable soups for lunch or snacks or even broth soups. Each of these gives your loved one flavors they can enjoy while providing valuable hydration to the body as well as fiber and vitamins. Add fruit to the water. Try making water more interesting for them by adding sliced fruit. Cut up berries, cherries, citrus, or even vegetables such as cucumbers and put them in a pitcher of water. Put this pitcher in the refrigerator and allow it to steep for a couple of hours. The fruit will imbue the water with a light flavor that may make it more palatable to your parent. If you serve it with some of the fruit in it, they also get the added benefit of eating the fruit. Flavor powders. If fruit is not enough to give your parent the flavor they need to enjoy drinking water, try flavor powders or drops. There are many of these products readily available on the market and they cover a huge variety of flavors. There are even some now that are all-natural. This will give your water a boost that may make them more willing to consume more. Decaffeinated beverages. The primary reason beverages such as coffee and tea are often excluded when it comes to fluid counts for the day is that they contain caffeine, which dehydrates the body. If your parent chooses decaffeinated versions of these beverages, however, they can enjoy the flavor without the dehydrating effect. Avoid soda as the carbonation can be detrimental to the health of your parent’s bones and teeth. Talk to your loved one’s doctor about specific tactics to help them remain properly hydrated. Starting a senior care arrangement for your elderly loved one is a fantastic way to help them to stick to the nutritional guidelines they need to follow in order to stay healthier and stronger. This senior home care services provider can evaluate your parent’s specific needs as well as their likes and dislikes and create an approach that is tailored to these so your parent is more receptive to them and willing to cooperate with them. This can mean going to the grocery store with them to help them select foods that fit with the guidelines and recommendations set forth for them by their doctor, preparing meals and snacks with them, or even just enjoying these meals and snacks alongside them to offer companionship and encouragement.